Diva is a Program Officer (Measurement, Learning and Evaluation) with the Bill & Melinda Gates Foundation in India, where her portfolio includes research and evaluations in gender, ICT, nutrition, child health and youth. Diva is also leading impact evaluations in gender and education. 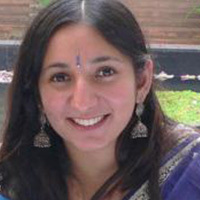 Diva was formerly Associate Director at J-PAL South Asia for evaluation capacity building and the Program Director of the Centre for Learning on Evaluation and Results (CLEAR) in South Asia, where she worked on strengthening M&E capacity in the region and promoting evidence based decision-making. Previously, she worked for J-PAL and Innovations for Poverty Action (IPA) on several impact evaluations in India, Bangladesh and Morocco dealing with governance, education, gender and urban services. She has also worked as consultant for the World Bank, Planning Commission and other non-profit organizations in the U.S. and India. Diva has a Masters in International and Development Economics from Yale University and a B.A. in Economics and International Relations from Mount Holyoke College.